An international effort is under way to save Russia's Phobos-Grunt mission to Mars, but time is quickly running out on propelling the probe toward the Red Planet. The interplanetary undertaking is designed to visit Phobos, one of the moons of Mars, and return samples to Earth by 2014. But Phobos-Grunt's deadline only chance for departure from Earth orbit is projected to be Nov. 24, due to the alignment of Earth and Mars as well as the spacecraft's fuel status to attain the outward-bound oomph required. "We are trying to help them out of trouble," said Wolfgang Hell, the service manager who is overseeing the European Space Agency's support to Russia's NPO Lavochkin, the main contractor on the Phobos-Grunt project. Hell is based at the European Space Operations Center in Darmstadt, Germany. "Normally, we were supposed to step in, so to speak, and provide tracking services with our ground station network once the spacecraft was on an escape trajectory to Mars," Hell told SPACE.com. "It was never planned that we would support the spacecraft while in the near-Earth phase." Hell said that his Russian colleagues have gained a better understanding of what ails the spacecraft. "They reached the conclusion that they have some kind of power problem onboard. So they have become more specific in terms of what we should be doing to help them." But that help embraces a number of challenges, Hell said. For instance, the spacecraft risks running out of electrical power each time the probe is eclipsed as it spins around Earth. Commanding Phobos-Grunt , therefore, is possible only while it's facing the sun. Also, due to a lack of downlink from the craft's onboard transponder, ground trackers must rely on imprecise radar-tracking data. Not knowing exactly where the spacecraft is makes pointing ground transmitting antennas correctly a challenge. "It takes a lot of luck to really hit the spacecraft with a main beam," Hell said. "Because it's in such a low-Earth orbit … we have so little time, something like six to eight minutes, to get the command up." The European Space Operations Center has volunteered to modify its 15-meter ESTRACK radio dish in Perth, Australia, to broadcast a very wide beam over the next few days, in hopes of successfully commanding the troubled probe. That could work, "unless there's something more serious with the spacecraft," Hell said. There's not much time left, Hell added. "Right now the ultimate goal is still to rescue the mission. I'm not sure how good the chances are…but that's what we are working on." 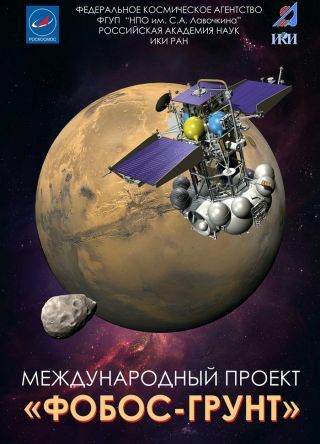 According to Hell, the estimate by Russian space engineers is that Phobos-Grunt has until Nov. 24 to blast out of Earth's orbit and head toward the Red Planet before it has lost its only chance. "That's the launch window. Beyond that day, there's not enough fuel to make it to Mars anymore," Hell said. Russian space engineers, he said, think the spacecraft's onboard control system is still in good shape, "and therefore there's still hope to recover the mission." Hell said that the Russians have also concluded that, based on their observations, the space probe's attitude-control thrusters are working nominally. NASA, too, is engaged in trying to save the misbehaving spacecraft, working with the Russian Federal Space Agency, Roscosmos. "NASA is currently working with Roscosmos to provide requested technical and communications assistance regarding the Phobos-Grunt spacecraft using NASA's Deep Space Network and other assets. These efforts are ongoing. For further information on the Phobos-Grunt mission, please contact Roscosmos." Meanwhile, an attentive network of amateur satellite trackers is keeping an eye on the fate of Phobos-Grunt — and the prospect that the spacecraft may re-enter the Earth's atmosphere. "There is never sufficient data on the forces acting on a satellite near decay to confidently predict the date of re-entry much in advance. It's a lot like forecasting the weather," said Ted Molczan of Toronto, Canada, a leader in the community of citizen satellite watchers. Estimating the date when Phobos-Grunt will decay from orbit is further complicated by small orbit maneuvers that the spacecraft appears to be making, Molczan told SPACE.com. Those maneuvers have been offsetting about half of the effect of atmospheric drag. Given the variables, the spacecraft may remain in orbit until mid-February of next year, Molczan predicted. "If the maneuvering were to cease today, then decay would occur in early January. The uncertainty of both estimates is at least a couple of weeks."